The Titanite Demon is an intimidating foe that often guards valuable items or important areas in Dark Souls. It is also one of the few sources of rare Demon Titanite for weapons upgrades. It attacks by swinging its Titanite Catch Pole or, if at a distance, it fires powerful long range lightning bolts. As the name suggests, the Titanite Catch Pole can in rare instances be used by the demon to grab and pin the player for high or sometimes fatal damage. Players can take advantage of its slow turning speed to attack it from behind; however they must still be wary of its jumping pounds and tail sweeps. Although all Titanite Demons look the same, some are more powerful than others so managing to kill one does not necessarily mean you are prepared to face all of them. While the Titanite Demon's lightning bolt attacks will be blocked by obstacles, its catch pole will clip through walls and obstacles making it dangerous even if you are behind cover. Titanite Demons are all born from Titanite Slabs. Titanite Demon may be part of an overarching theme that links demons and dragons to minerals (read more). Titanite Demons are weak to weapons imbued with lightning, either elemental or Gold Pine Resin. Lightning spear miracles are also very effective, and the player may time his attack by beginning the lightning spear cast while still behind cover, and then stepping out just in time to throw the spear before retreating again. If you get lucky and the Black Knight in the Burg drops his sword, that does great damage to this thing. I took him out in 6-7 swipes? Any ideas why these have no right leg? seem&apos;s a bit deliberate. Titanite demon in lost izalith definitely doesn&apos;t have 40k hp in ng and propably not 80k in ng+ (at least in the remaster). It took me 8 great lightning spears, each dealing 408 dmg, to kill it so it has somewhere around 3200 hp. I noticed if u look close enough u can make out an engraving on its neck! can anyone confirm this? Can you cut its tail off? 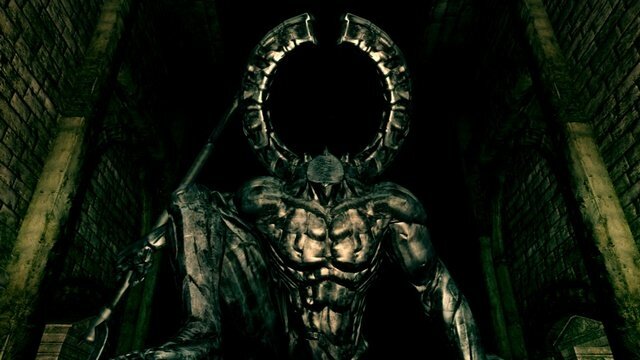 A general strategy for Titanite Demons is to run to their left side (the side without the weapon) and stand next to it between its arm and tail. Hit it once or twice depending on your speed and if it stops moving it will probably use its jump attack so just run past its tail and it should miss then run back and repeat. Titanite demons are NOT weak to lightning, they are resistant. Using lightning is essentially challenge mode. For the Titanite Demon guarding the Darkroot garden entrance, try moving to the left as you come down the stairs. It will keep using ranged attacks, but they can be blocked by a broken pillar right in front of it, but leaves enough of it exposed you can casually shoot arrows without fear of taking any damage at all. The following strategie worked well for farming for me: If you come from the Demon Ruins&apos; side of the bridge (only after you open the shortcut), you can run up to it (it won&apos;t notice) and hit a heavy meele strike (both handed) on his tail. If you turn around and run back (beware of his lightning projectiles) you can hide sideways (when you just ran off the bridge). He will turn back after a few moments (to the Lost Izalith side of the bridge). Wait a few additional seconds after he is in his default move pattern (5s is not enough, 6s will do), and you can repeat this pattern until he is dead.Note that it will take quite some time though (my lightning axe +4 in NG did 241 damage) as you will probably not get a second hit on him. On the other hand you will be able to take him down without getting hit at all. Then be careful and don&apos;t be such an egotistical dumbass.